The best year to beat is still the whopping 87 233 minutes for the whole year!!! Let's beat those guys grade 4/5 this year!!!. Read, read, read and read some more Oui Monsieur!!! Get your books ready, we will start the school year with two great sponsors. Thanks to Josh and Terra from Booster Juice and Allison at Cineplex Galaxy for their generosity in encouraging kids to become Jedi Master readers!!! Your minutes will get you some treats and entertainment. À vos marque, prêt, partez!!! Read a minimum monthly 500 minutes and you shall receive a treat from Booster Juice. Read 1000 minutes for two consecutive months and receive a courtesy free admission ticket to go see a movie at the Medicine Hat Cinemas (Cineplex Galaxy). Few things are funner than sharing a movie with your family. Thank you Madame Allison from our Grade 4/5 class this year! A Canadian sponsor!!! On behalf of the whole grade 4/5 class, thank you Madame Terra. Merci to Madame McKinley, ColoLoco a local business, sponsoring us succulent free chocolate cookies all done with organic ingredients like the famous organic coconut oil!! Visit her store on 2nd street by the Greyhound to see all the amazing organic products and give your health a boost. 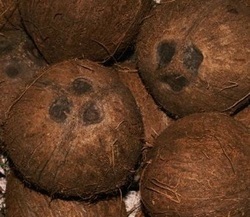 could count all the ways the coconut serves us."